Turkey is a beautiful country of dramatic landscapes, magical stories, rich history and friendly people. The food is fantastic too. It is an incredible destination and is unique in several ways. Here are a few things you should know before you go so you can make the most of your visit. There are so many magical things about Turkey you could spend years there and constantly be learning things. Whether you are considering moving to Turkey or simply enjoy the privacy of cheap holiday villas the experience of being self-sufficient in a foreign country is both interesting and very satisfying. Turkey can seem loud and chaotic at times but I have always found Turks to be very friendly, generous and tolerant towards others, making Turkey the ideal place to get out-of-your-depth in a foreign culture! Turkish is a complicated language but earning a few words will be appreciated by everyone you meet. In Turkish hello is “Merhaba” (pronounced ‘Mare-har-bah’); please is “lutfen” (pronounced ‘loot-fen’) and thank you is “tesekkur ederim” (pronounced ‘tesh-ek-ooor-ed-erim’). Don’t panic if you struggle to remember though because English and German are widely spoken. Don’t be afraid to try things. Turks are very generous and providing for guests is a huge part of their culture. Many people, especially in villages, grow their own fruit and vegetables and are likely to offer you some. I will never forget the look of confusion on my mother’s face when my Turkish landlord (complete with enormous bushy moustache) handed her a bowl of various fruits and herbs from his garden, simply to make my mother welcome because she had come to visit me in Turkey. If you take your children to Turkey they will be adored and indulged everywhere you go. There is no need to be embarrassed if your children cry or are noisy while playing as Turks consider children to be a blessing and they are generally spoiled rotten. If you befriend locals while in Turkey and are invited to their home remember that shoes are usually left outside. Even if there is not a heap of shoes outside the front door it is polite to remove your shoes when entering someone’s home. Ironically you will often be offered slippers inside because a favourite Turkish belief is that you will get sick if you have cold feet! Some of Turkey’s plumbing leaves a lot to be desired. If you spy a bin in the bathroom, that is where you should put toilet paper. Putting it in the toilet will probably block the system. Lots of insects and other creatures love Turkey’s hot dry summers. When you go out in the evening it is a good idea to wear insect repellent. If you see tortoises try to avoid the temptation to pick them up, they don’t particularly enjoy it and are often infested with ticks. Wild pigs sometimes roam into gardens. They can be unpredictable, especially boars. If you see one, move slowly away from it and try not to alarm it. Wherever you go it is polite to be respectful towards local norms. 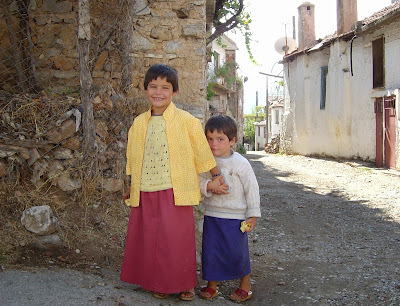 Turks dress modestly and, especially in remote rural areas, visitors should do the same. Turks are very tolerant and this doesn’t mean women need to sport burqas but you should wear more than swimwear everywhere except the beach. This applies to men too. Another way to be respectful is to be aware of significant dates in the local calendar. In Turkey the ones most obvious to visitors are April 23, which is National Children’s Day, notable for the amount of noise produced by children marching around the streets with drums! October 29 is Republic Day and November 10 is the anniversary of Ataturk’s death. Ramadan is observed in Turkey and currently falls in the summer months. During Ramadan people fast during daylight hours so it is a kindness not to wave food around unnecessarily at this time. Exploring Turkey's incredible villages and mountain scenery is very rewarding. In Turkey, vehicles drive on the right. Other than some of Turkey’s mountain roads that cling to cliff-edges, and seem a bit daunting, roads are fairly good. However, some of the habits of Turkish drivers are unusual. Turks use their car horns to communicate many things ranging from “Hello!” or “I’m here!” to “Get out of my way; I’m not stopping!” so you will quickly get used to driving being a noisy activity. Roundabouts can also be confusing as any vehicle in any lane may turn left and giving way is not routine. Large and slow vehicles often indicate left to say ‘you can overtake me’. You should be extremely careful if you intend to turn left because as you slow down, while indicating, drivers behind may overtake you. It shouldn’t happen unless you are driving a big truck but it is certainly something I think is worth telling people. Turkey is a fascinating country and I consider it a second home. Having spent several years there I am very familiar with the unique experiences the country offers and hope this guide helps you explore Turkey confidently and have a wonderful time doing so. Have you been to Turkey? What would you add to this list?